A Year After Tsunami, Town Continues to Rebuild Peuken Bada lost nearly half its population in last year's tsunami. Now, nearly a year after a wall of water swept most of the Indonesian town away, homes are being built and a new school is open. But residents are still struggling with the trauma of the disaster and the slow pace of reconstruction. The tsunami displaced Samiruddin and Rohani, back and right, who now live about five miles inland. They are not eager to return to Peuken Bada because of bad memories there. 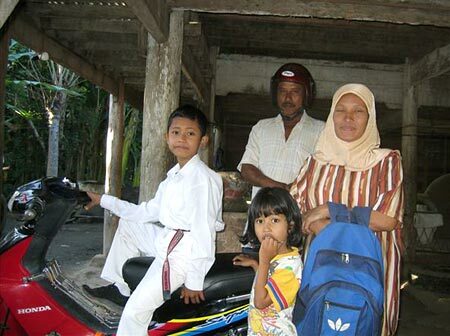 But their son, Yusran, left, attends school in the coastal village. Yusran, 10, attends this new elementary school in Peuken Bada. It opened a few months ago, replacing the tented one that UNICEF put up in February. 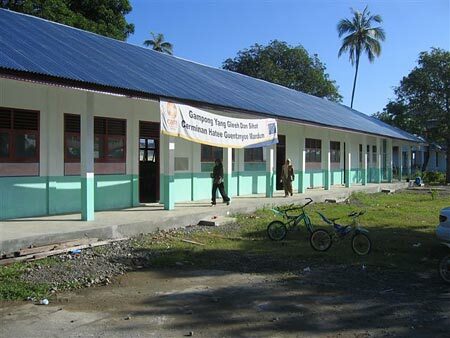 The original school, like just about everything else, was washed away by the tsunami. 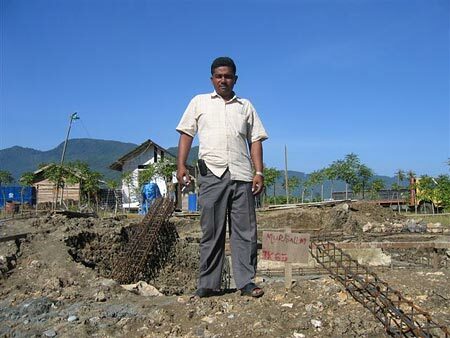 Peuken Bada resident Mursalin lost his wife, two children and his parents in last December's tsunami. He stands on the foundation of his new permanent home, which is being built by a Catholic relief charity. See a May 2005 photo of Mursalin in a temporary house. 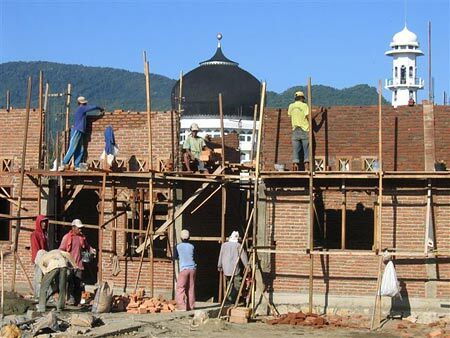 An Italian charity is putting up new houses near the mosque in Peuken Bada. The black-domed mosque was practically the only structure left intact after the tsunami. A year ago next week, a massive earthquake struck under the ocean floor off the Indonesian island of Sumatra. The wall of water generated by that event left nearly 170,000 people dead or missing in the Indonesian province of Aceh alone. Hundreds of thousands more were left without homes in the tsunami's wake. Dozens of villages and towns were swept away. In Peuken Bada, more than 10,000 people -- nearly half the population -- were lost. Michael Sullivan continues his series of occasional reports on the town's recovery. Next to the town mosque, the only structure that survived intact, stand temporary wooden barracks where residents wait for permanent housing to be built. Others live in tents, or with relatives. Some of the displaced residents are angry that they've had to wait so long for a return to normalcy. Laswani, one of the residents of the barracks, isn't mad at the government or at aid organizations. She's angry with herself -- for not doing more to save her three children, who were swept away. And yet, a year later, she says she is luckier than most. Her husband is working again. Her new house is almost finished. And she has a new daughter. But it's not the same as before. "We weren't rich and we weren't poor," Laswani says. "We were somewhere in the middle. And I had my children, so I was happy. But I'm trying to be patient, I'm hoping that things will get better -- that I will feel better, with time." There are signs of progress in Peuken Bada. 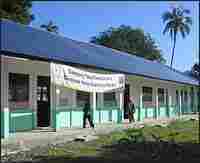 A new elementary school was finished in September, replacing the tent put up by UNICEF in February. But too few students are left to use the new facility. Surplus desks and chairs are piled high against a wall. Nearly 300 students attended this school before the tsunami. Fewer than 50 remain. Those students who did return are having trouble concentrating. "Maybe it's because most have lost their homes or their parents," says Erlinda, the science teacher. "But they are doing better than they were at the beginning. Or even three months ago. But I don't think they'll be back to normal for quite some time." Few of the students' families have moved back. Most of the children commute here from the barracks, or tented camps, or from the homes of friends or relatives who took them in after the tsunami. For one student's parents, the thought of returning to Peuken Bada is too painful. A mother named Rohani is still afraid of water. Her husband, Samiruddin, doesn't want the constant reminder of what he lost -- brothers, sisters and parents. "There aren't enough people back in our village yet to make me want to return," Samiruddin says. "It still feels like a ghost town. Maybe we'll go back eventually, but not anytime soon." One of the first residents to return to Peuken Bada was Mursalin. Tired of waiting for the government or an aid organization to help, he scraped together enough money to build a simple one-room shack on the foundation of his old home. That home was washed away -- along with his wife and two small children -- when the first wave hit. 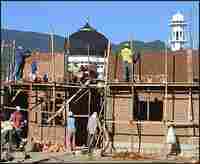 Now, workers are building a newer, bigger home for Mursalin. It's one of 260 that Catholic Relief Services has promised to build here. The news has been good lately for the 31-year-old resident. He recently got a new job and got remarried -- to a woman he met in one of the camps. Now they plan to start a new family. "Yeah, it's been a good couple of weeks for me," Mursalin says. "I even remember how to smile. My head feels brighter. And my heart feels lighter."